Sandals Resorts offer the ultimate romantic destination for celebrations of love: Sandals wedding packages. Whether you’re tying the knot in paradise by yourselves or taking your family and friends with you, we specialize in working closely with Sandals to make your special day everything you’ve dreamed it could be. Their signature WeddingMoons are designed to make your wedding and the days that follow a beautiful, memorable event in paradise. What’s Included in Sandals Destination Wedding Packages? If your family and friends are coming along, your wedding party is eligible for wedding group inclusions. A minimum of certain nights must be booked for a certain number of rooms to receive the special offers. 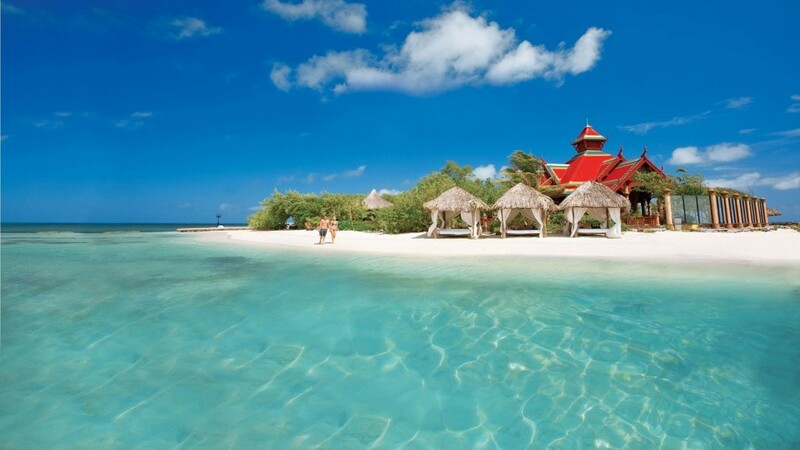 If you book five (5) or more rooms at the Sandals Resort (including the bride and groom’s) for a minimum 3 night stay, you will earn the bride and groom a free honeymoon room. If you book ten (10) or more rooms, you will earn the above as well as give the bride and groom up to 5 free nights (if they book 7 nights or longer) or 3 free nights (if they book 5 or 6 nights). The bride and groom will also be eligible to Test Drive Their WeddingMoon for 2 nights starting at a very special rate of $500. The bride and groom will also receive up to a $700 credit towards their stay. You’ll also receive a group pre-registration and private check-in upon the group’s arrival, a 1 hour Classic reception with sparkling wine, and a signature wedding cocktail for the wedding group. If you book twenty (20) rooms or more, you will earn the above and a 2 hour Splendid wedding dinner reception, plus a Catamaran Cruise for the wedding group (Jamaica and Turks and Caicos only). Now you don’t have to go all the way to the South Pacific to have a romantic, overwater experience! Sandals has built beautiful overwater chapels at two of their resorts: Sandals South Coast in Jamaica and Sandals Grande St. Lucian in Saint Lucia. Say “I do” in an intimate setting surrounded by the blue waters of the Caribbean. If you prefer to have your toes in the sand while you exchange your vows, the private island experience could be the perfect fit! Sandals has two resorts with exclusive islands for your most special occasion. Journey to Sandals Royal Bahamian in the Bahamas or Sandals Royal Caribbean in Jamaica with your loved ones and begin your newlywed journey in private paradise. With only 6 villas on the entire island, Fowl Cay Resort in the Bahamas is an even more exclusive experience. You can bring your extended family (including children) and friends and have the entire island to yourself for your destination wedding. Sandals offers additional pre-designed themed wedding packages as well as the option to completely customize your wedding to reflect your favorite colors, personal style, and other preferences. Additional fees will apply for themed packages and customized extras. In short, a stress-free experience! Your wedding details will be handled by our dedicated travel team and the wedding specialists at Sandals. We work together to create your dream wedding from the big picture to the smallest details. The best thing about the Sandals Beautiful Beginnings package is that it’s complimentary with your stay of 3 nights or more at the Sandals resort of your choosing. Themed wedding packages range from $1700 to $2900, and you can select specific add-on items from the Sandals wedding catalog. Prices vary by item and quantity. We work with all budgets and requests to make your wedding tailored to your unique celebration of love! What are the wedding sites on property? Most of the resorts offer a beach, a garden and a gazebo location. What flavors are available for the wedding cake? There are four! Choose from vanilla, chocolate, Caribbean fruit, and red velvet. The best way to travel with your beloved wedding dress depends on which method of its transportation would make you feel most at-ease. Brides-to-be can definitely bring their wedding dress through a security checkpoint. You should transport your dress in a garment bag and carefully lay it flat through the x-ray process. If your dress can’t fit, the dress can be screened manually by gloved TSA officers, requiring the opening of the garment bag. We strongly advise to contact your airline and ask about bringing the wedding dress on the plane. Some aircraft have closets in first class that can hold the dress, while others may not, which could cause challenges in storing the dress above the seat. Airlines will also count the dress as a carry-on item. Is there Tuxedo rental available in the island? No, but some Sandals resorts have contact information for local formalwear providers (varies by island). Due to the Caribbean climates, you may want to consider a light weight alternative for the groom such as a button-down shirt and cotton shorts. Can children attend my wedding? Sandals properties are adults-only, but you can have weddings at the family-friendly Beaches resorts too! When do I finalize my wedding details? All details should be finalized 60 days prior to arrival. What are the government fees and how can I pay them? All fees can be mailed as long as they are with your wedding confirmation number. The fee must be received 7 days from the date you booked the wedding to avoid booking cancellation. Government fees are not included in your package price. Is my wedding legal in the country where I reside? Yes, the marriage is a legally binding marriage. Contact your local government regarding name change procedures, etc. prior to your travel. Can I get married at a different resort than where I am staying? No, you must get married at the resort where you are staying. Is there a fee for the use of a personal wedding planner? No! 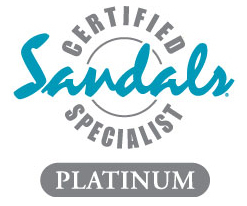 Sandals provide a complimentary, personal pre-wedding and resort wedding planner for each bride and groom. We work closely with your wedding planner to make sure that your wedding plans and travel details are all taken care of. What are the different types of ceremonies I can choose from for my wedding? A non-denominational minister customarily presides over wedding ceremonies at Sandals, but can accommodate a non-religious ceremony (justice of the peace) or a religious ceremony at an additional cost. Can I bring down my own wedding décor items and favors? Yes, but do so at your own risk. There are custom laws that will require you to pay taxes and duties on these items or they might be confiscated if they are deemed as commercial items. There is an applicable set-up fee for bringing your own items. Are medical or blood tests required to get married? No, the islands of Jamaica, Antigua, Bahamas, Saint Lucia, Grenada and Barbados do not require a medical or blood test to be performed.